All props used, innocent in appearance and common place. If you want to get started performing Q&A and want a complete, field-tested, proven, powerful routine, My Q and A would be my # 1 recommendation. As a long-time fan and avid supporter of ALL of Scott Creasey's work, I was quite excited to check this one out (and thanks to Ray's recommendation above, I also picked up "Number 5" and will comment more on both these releases when I have a little more time). There's a lot to love about "My Q&A" and though our individual styles, criteria and personal approaches to Q&A are diametrically opposed in many ways, I'm a huge fan of the genre and do my best to consume just about everything released on the subject. To say that I was incredibly impressed with Scott's Q&A method, approach, structure and all the thinking behind and going into it would be a huge understatement. I highly recommend this ebook and for the menial asking price it really can't be beat. Speaking for myself only, I would have been happy paying 10X more for this phenomenal piece of work. To touch very briefly on just a few specifics, I love that the "gimmick" in this case is not really a gimmick at all (using every day, EASILY AVAILABLE items in sneaky, subtle and spectacular ways)...also that it uses full size 3X5 sized index cards as opposed to smaller half-slips or unruly palm-sized billets, that the dirty work is done right out in the open and the reading process occurs in full sight of your viewing audience members and participants. While the mechanics are all perfectly hidden, there really isn't anything to "hide." Scott developed the routine over several years and countless performances as an actual worker, which I respect above all else, and after reading the method and material a few times with the necessary items in and and giving it a formal test-run at my last home party, the results and reactions were far more than I myself was expecting or could have prepared for. 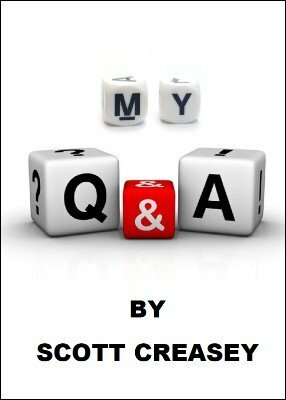 While this will in no way, shape or form replace my own Q&A and preferred methods, if you're at all interested in this sort of act and demonstration as a whole, Scott Creasey's "My Q&A" is a definite no-brainer. Complete with an interactive beginning, ultra-strong middle and memorable, powerful ending I don't feel ANY mentalist worker or psychic entertainer in this day and age would be anything less than ecstatic over their purchase - there's a whole lot of value here, the routine is complete, simple in execution, devastating in effect and would be a startling success in even the most inept hands. I highly, highly recommend this one and that you check it out immediately! Most of the items required I already had and a quick trip to the local office supply took care of that in less than 5 minutes. To end, I'm a big fan of Scott as a person and his professional offerings as a gifted creator and performer (before these last two purchases I've owned multiple sets of his FIP and BIP BT, both items which I've kept close when needed and used for years now) and again, to piggy back on Jorgenson's spot on review, I'm stoked that Mr. Creasey continues to share his world class thinking, powerhouse routines and professional WORKING GRADE material with the mentalism community. For the first time in decades, and after thousand books bought, we find here an author that speaks the truth word for word : : every statement done in the premise is respected, no stooge, no pre show, no preparation (he says 20 minutes, I have done all in 5! ), no electronics, no nothing except few envelopes and paper, really practical and performable on demand! In this manuscript, you find really psychological thinking together with practical advise, and after 20 years of Q&A peformed everywhere here in Italy, this is the only routine that I have read hat gives you ALL you need (except how to become a mentalist!) to perform a very good Q&A routine solving all the problems connected to it!!! Well Scott's done it again, I have to say that I completely agree with Scott that how you acquire the information is of paramount importance and in this routine Scott has excelled himself. There are no clever gimmicks, just a very clever combination of tried and trusted methods that result in an extremely clean, innocent and in the hands of a competent mentalist potentially showstopping Q?A. This is extremely well thought out, I bought it last week and ran through it with the necessary bits and pieces in hand and the more I worked with it the more I liked it. Scott's routine has at least a couple of moments built in where the entire audience are involved and has a clever climax to round the routine off.